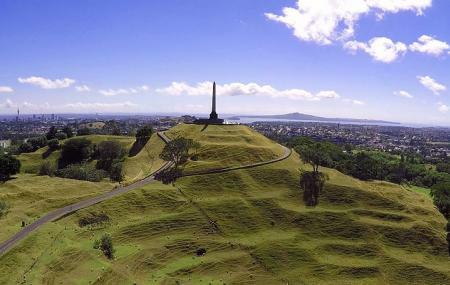 One Tree Hill is Auckland’s largest intact volcanic cone. Also known as Maungakiekie, a summit to the top gives you extensive and beautiful views of the city. The 183 metre volcano has three caters and a lava field as well. Surrounding the location are green meadows and you can find sheep grazing peacefully in the vicinity. At the top, there is a monument of a prominent public figure, Sir John Logan Campbell, and an Obelisk as well. Many people head over to One Tree Hill for a trek or an outdoor picnic and BBQ. The Cornwall Park situated there also attracts lots of tourists. The playground and toy train at the park is a favourite with kids. Cornwall Park Timings 7:00am to 8:00pm (Seasonal closing timings apply). Carrying snacks with you is recommended. How popular is One Tree Hill? People normally club together Museum Of Transport And Technology and Mount Eden while planning their visit to One Tree Hill. Auckland's most iconic hill top with great views on a sunny day. Handicapped recently by an incredibly stupid decision by council and Maori to stop cars driving to the summit. So going up has gone from being a 10 minute trip in any weather, to taking about 45 minutes and is really fair weather only now. Give us our hill tops back! There is an option to ring the council and get a code to drive up if you're disabled or a senior citizen... way to complicate things council. This is a great place with some awesome 360 degree views of Auckland and I always make it my plan to come here when I come to visit Auckland. These days you have to walk up the mountain but all worth it for the fantastic views. Love this place, play ground for the kids, BBQ area huge open fields scattered around one tree hill, Plenty of tree's to stay out of the sun in summertime, Public toilets underground, Restaurant and Cafe, A historic house to.see for the public so worth checking out.